Lawrence, Kansas, newspapers, on newspapers.com, contain numerous articles about Nat Miller. 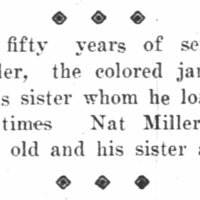 His 1912 obituary, for instance, indicates that Miller was a Civil War veteran, born in Madison, Kentucky, and worked as a well-liked janitor at the University of Kansas in Lawrence for 26 years. See the Lawrence Daily Journal-World, December 26, 1912, 1. 54 years old and his sister about 67. 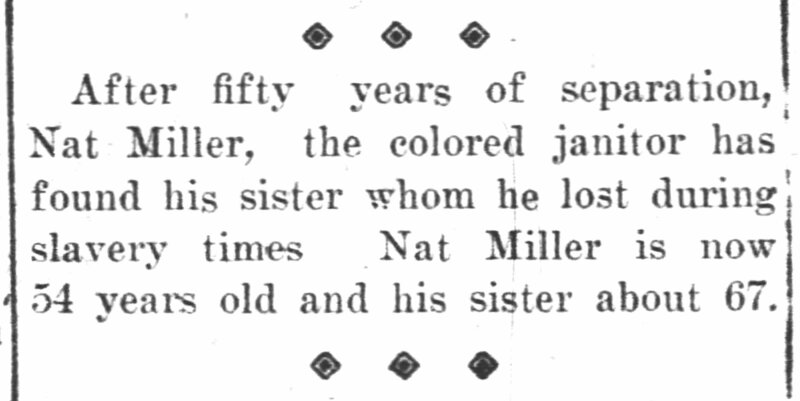 “Nat Miller reunited with his sister,” Other (Newspaper Article), Lawrence Daily World (Lawrence, KS), March 28, 1904, Last Seen: Finding Family After Slavery, accessed April 19, 2019, http://informationwanted.org/items/show/3418.